The waste hierarchy is a guide to managing food waste to benefit your business, the environment and the local community. All businesses are legally required to follow the hierarchy for their food and other wastes and to ensure it is passed to a registered waste carrier. 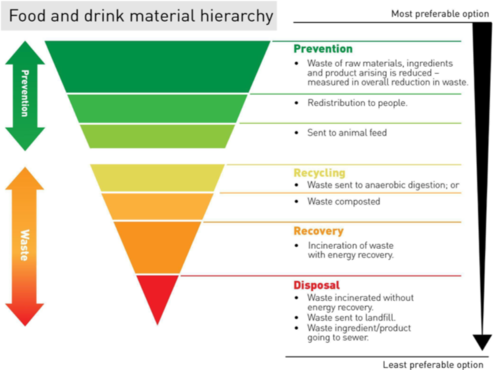 The food waste hierarchy prioritises food waste prevention. This means reducing food waste from your business as far as practically possible. If, after reducing food waste as much as you can, you find that you have surplus food which is still edible, consider redistributing it to others. For any food waste that cannot be eaten, work with a local waste company to collect and recycle your waste through anaerobic digestion or composting. If these options are not available, then arrange for the food waste to be sent for incineration, with landfill as a last resort.